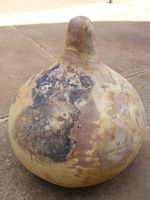 Lagenaria siceraria is a close relative of pumpkins and squashes - the dried fruits are popularly known as calabashes. There are also hairs on the leaf stalks and young fruits. It bears flowers similar to those of pumpkins but they are white and not yellow and they open in the evenings. Their fruit is light green and becomes pale brown when it ripens and dries out, leaving an empty thick, hard hollow shell with nothing inside except the seeds - the fruit flesh dries our completely. It needs well-drained soil preferably with a pH of 7, sun and it must be trained over supporting structures. The calabash was one of the first cultivated plants in the world and considered to be indigenous to Africa - grown not primarily for food, but for use as a container - the rind of the calabash is thick and waterproof. In Central America, the seeds of the calabash gourd are toasted and ground with rice, cinnamon, and allspice to make the drink horchata. In Bangladesh and Nepal the tender young gourd is cooked as a summer squash. In Vietnam it is boiled, stir-fried and used in soup dishes. In some countries it is worked, painted and decorated as shoulder bags or other items by artisans, and sold to tourists.